Blackjack players after a new variant should look no further than Royal Vegas Casino, offering the exciting Microgaming title known as Spanish 21. Based loosely on blackjack, all 10s are removed, leaving a 48 deck. Face cards still remain, and favourable rules are introduced in order to balance the house edge. We take a look at the game of Spanish 21, the rules involved, and other reputable Microgaming casinos you can find the real money title at. Spanish 21 is a real money blackjack variant which is available online and at land-based casinos. However, in Australia and New Zealand it is known as Pontoon – this shouldn’t be confused with online Pontoon. 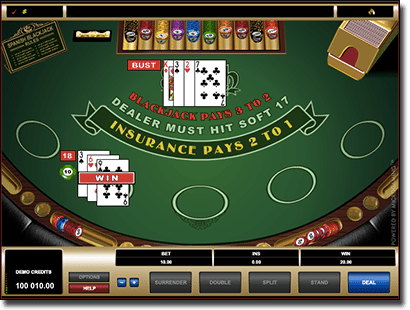 The aim of the game follows the same concept of classic blackjack: Players attempt to get 21 without going bust – but all four 10’s in the deck have been removed. There is usually more than one deck, with generally six to eight 48 card decks in play. With the removal of the four 10s from each deck the house edge is immediately increased, but the rule variations and additional payouts we’ve mentioned above brings the house edge back down. The best thing you can do is play online for the lowest possible house edge as it is less than 1% online and generally more than 1% at land-based venues – it can be as much as 3.06% for an eight deck shoe at land-based venues. However, in Australia you can find Pontoon (Spanish 21) as low as 0.41% at some land-based venues if you play the basic strategy. 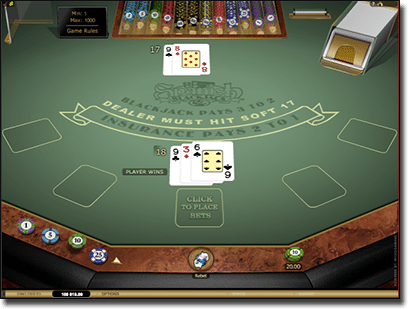 Spanish 21 isn’t as widely available on the Web as classic blackjack variants, but there is one top leading software developer with a title – Microgaming. Additionally, it is important to note while we have mentioned in Spanish 21 in Australia is called Pontoon, this shouldn’t be confused for Spanish 21 when we go online – Pontoon on the Web is a completely different blackjack variant. The house edge for this variant can get as low as 0.38% – provided you play the basic strategy (the chart for this variant is available online). It is also important to note the bonus payouts we listed above do not apply after Doubling Down on this Microgaming title. Spanish 21 Gold by Microgaming is also available, offering the same rules but superior graphics and larger table limits set at a maximum of $1000 (the standard title has a maximum bet of $200). Where can I play Spanish 21 online? You can find Spanish 21 and Spanish 21 Gold at our favourite Microgaming blackjack sites listed in our tables at the top of the page, and we particularly recommend Royal Vegas Casino – our number one site for the Microgaming exclusive catalogue. You can access the title by downloading the software (only available for PC users) or instantly play it via your browser (Safari, Chrome, Firefox, etc.,) and play with AUD to potentially win big.